Burpies and Spotty Dogs - Whatever Next! Earlier this week the whole school became fitness fanatics! 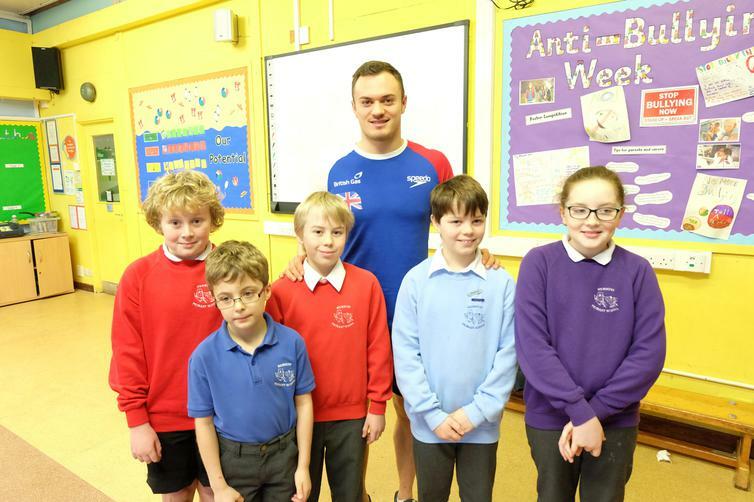 The school held a sponsored exercise event to raise money for the school, to purchase additional sports equipment, and funds to support our Olympic athletes in their quest for representing GB at the Rio Olympics this summer. Anthony James, a local GB Olympic swimmer, came to spur everyone on, and he certainly did that. We wish him the very best in his selection process and shall be looking out for him at Rio 2016. A massive well done to all the pupils, and you may notice a few adults, for their exercising, and of course to families for sponsorship. Once we have collected all the money we will let you know how much was raised and then goodies will be distributed, once received. Click here for link to PE gallery.